Damage to parts of the orbitofrontal cortex (OFC) heightens monkeys’ defensive response to non-threatening stimuli, according to new research published in JNeurosci. The study proposes a critical role for subregions of this brain area in different anxiety disorders. A network of brain regions including the OFC has been implicated in human anxiety disorders. For example, previous research has linked arachnophobia and generalized anxiety disorder to decreased activity in lateral and medial OFC, respectively. Elisabeth Murray and colleagues from the National Institute of Mental Health and Icahn School of Medicine at Mount Sinai investigated the role of these OFC subregions in male rhesus macaques trained to retrieve a fruit snack reward in the presence of one of two fake, rubber predators — a grayish-green snake or a black, hairy spider — or a neutral object. 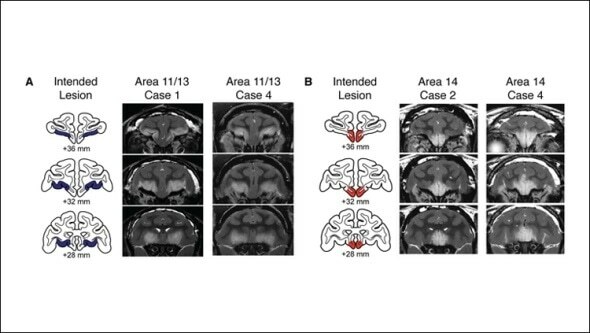 After selectively lesion the lateral or medial OFC in eight monkeys, the researchers observed heightened defensive and reduced approach responses in these animals compared to 12 animals with intact OFC. Both experimental groups also failed to reduce their defensive responses to the snake and spider over time. Overall, these findings suggest the specific symptoms that define various anxiety disorders may be supported by distinct brain areas.